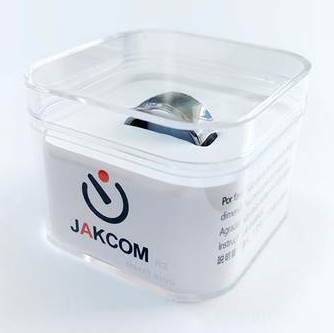 The Jakcom smart ring is a Wearable electronic components, it can connect IC / ID / NFC Card Reader like doorlock or cellphone to Unlock、Pay、Share information or Operate some mobile function ; Original Health Module can improve human performance effectively. The product shape is designed according to the international popular elements, created by the pure medical titanium, no need to charge, high waterproof, and suitable for any people at any time. Main function is divided into “Health Module”、”ID Module“、”M1 Module“ and “NFC Module”. Germanium is a kind of rare metal and its content is only about 0.0007% in the earth's crust. It has superbly high health care efficacy, can improve the modern people’s comprehensive symptoms caused by the lack of exercise, working pressure and air pollution. FIR Energy Stone. All materials extract from natural mineral ,so that can release more pure Far infrared ray , Scarlar Energy and negative ions . Effectively improves the “Krebs Cycle” ,Thus improves Energy , Endurance and Strength .It also can help peploe effectively resist the electromagnetic wave from computer ,phone or electrical appliance. The “ID” Letters area can simulate and copy full frequency various kinds of ID card smart chips, such as 125 KHZ frequency band of EM/HID/TI series ID card chip. The “M1” Letters area can simulate and copy non-contact M1 type smart chips of IC card, such as 13.56 MHZ frequency band of Mifare M1 S50, Fudan F08 IC card chip. It allows you to easily get rid of those sundry and boring traditional square or buckle style of induction card and effortlessly pass all kinds of places from now on.